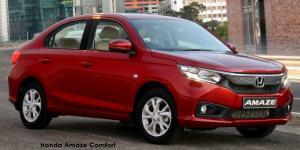 The Honda Amaze, available at Mekor Honda Tygerberg, is designed with your family’s needs in mind. The edgy exterior and spacious interior ensures comfort and ample legroom for both front and rear passengers. The Honda Amaze also features 420-litres of boot space, sufficient cabin storage space and cup holders for both front and rear passengers. The Honda Amaze delivers on fuel efficiency without compromising driving pleasure with its 1.2L i-VTEC engine available in either CVT or manual transmission. Visit Mekor Honda at Mekor Honda Tygerberg for Cape Town Northern Suburbs, Stellenbosch and Somerset West for the comfort and premium cabin feel that the Honda Amaze offers.